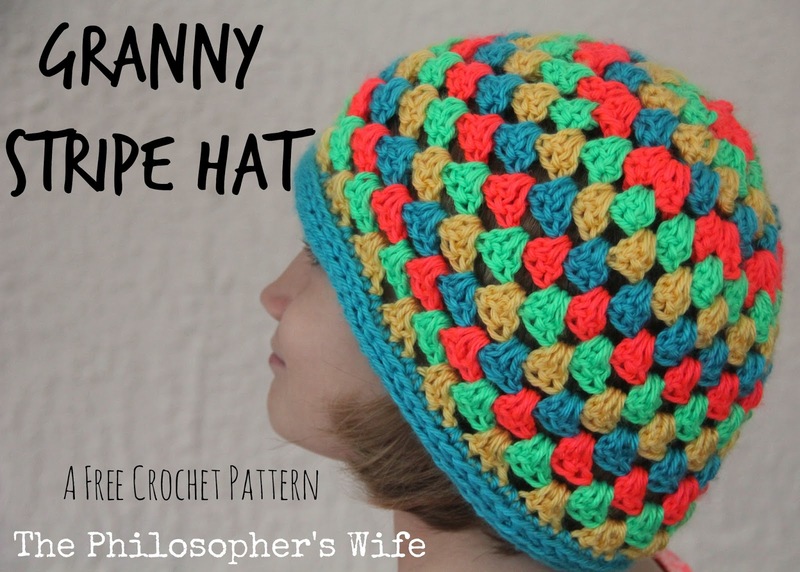 This Granny Stripe Hat is my first of the Granny-Spiration Project. (Read more about this below, and be sure to enter the giveaway!) This is an easy hat to crochet and works up quite quickly. I used an H hook and Caron Simply Soft. 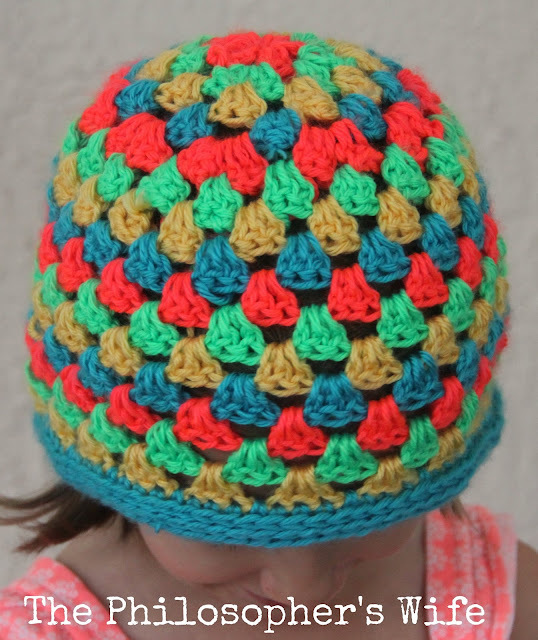 A note about fit and size: This is a slouchy hat. My lovely model has a larger than average head circumference for her age. This hat would properly fit teens and ladies. Row 1 *Two dc, chain 1*around until there are six groups of 2dc. Rows 3 &4 Crochet 3dc in each chain one space, keeping the chain one between each group. Row 6 - 10 3 dc groups in each chain with a chain 1 between each one. Rows 12 through 15 HDC in the third loop. Finish off. This Month's Giveaway is sponsored by EyeLoveKnots. One winner will receive a $10 Etsy Card to spend in any shop on Etsy! Must be 18 or older to enter. Open to all countries. Gift card has been purchased in US Dollars. If recipient is outside of the US, to use gift card, must go into Etsy settings and temporarily change to US Dollars. Void where prohibited. Winner has 48 hours to respond to email notification, or another winner will be chosen. EyeLoveKnots is responsible for prize fulfillment and shipment. New Granny-Spiration Projects will be shared from your hosts the first Saturday of each month. Post times will vary. You will be able to link up from 9am EST on the first Saturday of the month, through 11:59pm EST on the second Thursday from the start date - specific dates are on top of the Rafflecopter form - giving you almost two weeks to link up and enter the giveaway! Please share projects that are family friendly, and GRANNY INSPIRED through use of regular granny square or solid granny square, granny stitch pattern or other afghan square in the form of a free pattern, pattern review, or inspiration piece. Not limited to crochet or knit. *Link ups cannot be to Etsy listings or Ravelry pages where patterns are sold. You can link to blog posts, Flickr or Facebook pages, Pins, etc that are directed towards it, but can't directly link to it. To be clearer though, Raverly pages of finished projects are okay to share. Sorry for the inconvenience! That's per InLinkz guidelines. Thanks! why didn't I just wait untill I'd read your post?! I spent all last evening trying and frogging the hat for my cousin's daughter. It was past 10 p.m. till I finally was happy with it, but I didn't finish it till noon today. Ooo, those stripes are a great way to use up scraps! Very cool hat.